Smartphones perform the same things as a PC. They often contain confidential information like pictures, messages, banking details, emails and personal projects. 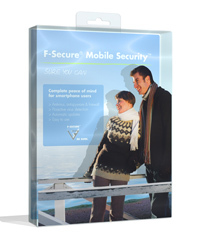 F-Secure Mobile Security enables smartphone users to enjoy the full potential of their devices without worrying about threats to their privacy. It even safeguards data in the unfortunate event the phone is lost or stolen. Complete, automatically updated security solution for smartphones. F-Secure Mobile Security makes your smartphone safe for today's connected life. * Includes firewall, real-time anti-virus and anti-spyware to protect smartphone against mobile malware. * Remote Lock can lock the phone easily with a single SMS message. * Theft Control locks the phone if the SIM card is changed. * Remote Wipe erases all the data on the phone - an ultimate safety measure to prevent misuse. * Works invisibly in the background, scanning all network traffic and monitoring the phone for malware. * Automatically retrieves newest updates whenever any data connection is used. * Additional SMS update mechanism for critical updates when a data connection is not available. * Smooth user experience thanks to light and efficient scanning technology. Qweas is providing links to F-Secure Mobile Security 5.1 as a courtesy, and makes no representations regarding F-Secure Mobile Security or any other applications or any information related thereto. Any questions, complaints or claims regarding this application F-Secure Mobile Security 5.1 must be directed to the appropriate software vendor. You may click the publisher link of F-Secure Mobile Security on the top of this page to get more details about the vendor.